New Directions Score with Bath YMCA! New Directions Education Bristol has recently had the chance to work closely with Bath YMCA who currently provide after school clubs for local primary schools. New Directions Bristol is committed to supporting the local schools and communities they work with, as a result of this commitment they contacted Bath YMCA to offer their support with any projects that may be beneficial for the children that attend the after school clubs. New Directions donated the use of its Penalty shootout to Bath YMCA for a month, the penalty shootout proved very popular with the children and staff alike. The New Directions penalty shootouts are an ideal way to engage children to participate in sports and also teach them sportsmanship. 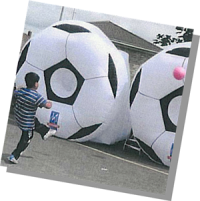 Lisa Blakeman, Branch Manager for New Directions commented ‘we as a company recognise that we have a responsibility to the communities we work with, that’s why we were excited about working with Bath YMCA and donating our penalty shootout. The penalty shootout was used by various schools including Moorlands Primary, St John’s Catholic, Newbridge Primary and St Phillips’.